The sweetlips are weary of divers, but by staying a comfortable distance from them, they will remain in the area allowing you to get reasonable photos and video. After about 20 minutes watching this group, they became relaxed enough to let me get in nice and close. These photos and video were shot underwater as part of my Great Barrier Reef Photography project while diving on Quicksilver’s Silversonic in Port Douglas, Queensland, Australia. 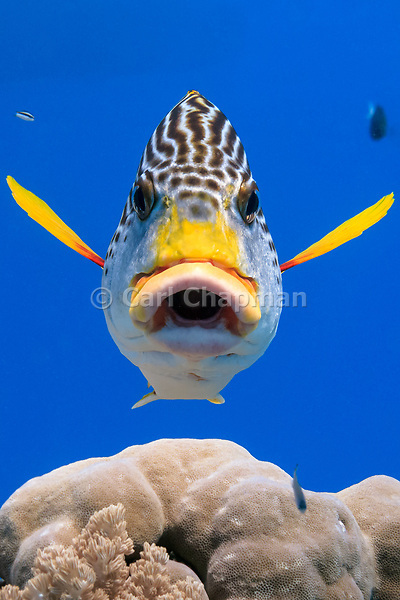 Just discovered one of these underwater Great Barrier Reef photos was licensed for use by TIME back in July.